After a lot of rain in early July, the last couple weeks have been beautiful. We are especially grateful for the moderate temperatures this year since the harsh winter left us with weaker turf than usual. The National Weather Service is predicting a similarly mild August with average rainfall which should equate to great conditions for golf. Below is the putting green on June 27th. I am often asked about the ornamental grasses you can see in the background along the first tee. They are Calamagrostis x acutiflora 'Karl Foerster'. Below is the 9th hole and clubhouse. On the left you can see some of the Ash trees that were killed by the Emerald Ash Borer over the last year. For more on this destructive insect see here. The renovated bunkers are performing very well. Improved drainage, new sand, and a sod "face" have greatly improved this sand trap on the first green. A small amount of rain used to wash this trap out and make it unplayable. Now it is playable hours after a strong thunderstorm. 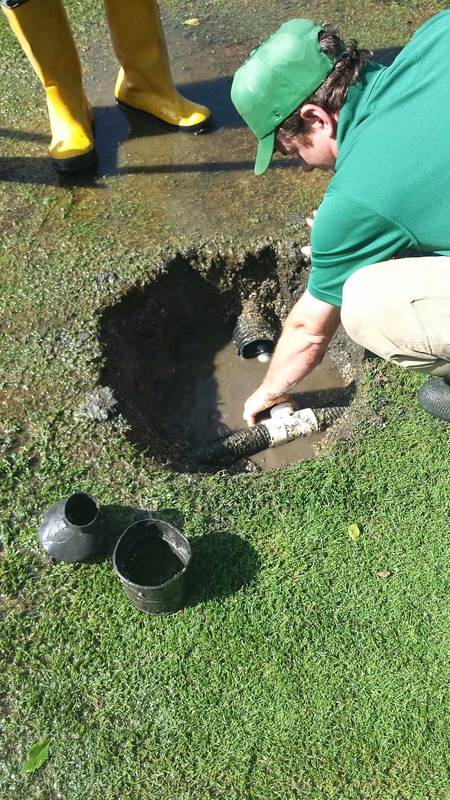 When it is too wet to mow fairways, one of our favorite pastimes is finding and fixing old drain lines. There are very few in the fairways so we have been finding the ones that are there and testing them. We just found the old lines on the 4th fairway. The good news is that the 4 inch line going to the creek works! The bad news is that the rest of the system is thin 2 inch spiral corrugated tube that is not flowing. It is crushed in many places. There is a good reason 4 inch is the standard size. In a situation like this we will get the system working as well as it can and install a catch basin here. At least the 4 inch line heading off toward the top of the picture will take water and the pea gravel around the 2 inch lines is collecting some water. In the future, reinstalling 4 inch lines in this area would help dry it out more quickly after heavy rain. At least now we have a better idea what is here to work with.